They came from far and wide. The young and the old...ish. All fans of Chicago's Wilco, who happened to make an unlikely stop at the University of North Texas (UNT) Auditorium in Denton, TX. Why unlikely? For starters, Denton has a tenth of the population that Dallas has; but Denton's roots in music are very strong. Also, UNT's Auditorium is a modestly-sized, old venue for the seasoned band of almost two decades. 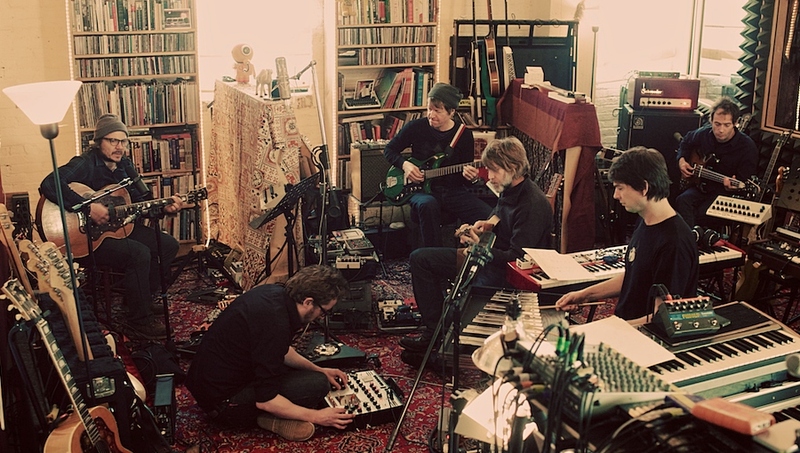 But for whatever reason, Wilco chose this space for a reason, obvious or not, and made it a point to reach out and touch everybody with their music. From a first glance, the seating was pretty typical for a university auditorium or theater. This was true except for the fifteen foot gap between the fans and the band; Jeff Tweedy, vocalist, even made the suggestion that we were at a "rock and roll petting zoo"; this was very reminiscent of my experience watching Titus Andronicus at Fordham University, but at that show, the administration marred the performance and ended it abruptly. I also recalled watching shows at the University of Oklahoma (OU) and instantly remembered no barriers or gaps between the stage and fans in Meachem Auditorium; however, of Montreal, Explosions in the Sky, and Band of Horses were still emerging bands at the time and didn't carry the fan base that Wilco does. This was evident when passing behind the Auditorium and seeing Wilco's very own big rig for their stage production and an extra large tour bus parked alongside; the bands at OU had their own economy van (complete with trailer) and rental equipment for the stage. A stark contrast to say the least. On with the show. Wilco didn't have an elaborate stage setup, per se, but it was very effective. Multiple sets of lights accompanied each note and every song as if they were an instrument on their own. From the opening chords of "Ashes of American Flags", the band was shown in a soft stream of light until they hit their stride and the venue was engulfed in lights and music. During songs like "Via Chicago", the lighting complimented the abundant noise with an seizure-inducing amount of strobes and flashes. The band played a balanced mix of new and older material, but it was evident that the band's classics were the hit of the night. Though the crowd was vocal and energized for the whole show, it wasn't until about halfway through their initial set that you finally heard the first space-filling song along to "A Shot In the Arm". And it wasn't until the band's twelfth song, "Jesus, Etc. ", that the crowd finally left their seats and amassed near the barriers and really embraced the band. But Tweedy still had some comments for the venue staff/promoters asking "What's with the barrier? You're established barrier?" Fed by the crowd, he exclaimed "Comfy and cozy? We're probably gonna get arrested...for inciting fun." And fun we had. People danced to each note that was played, sung every word to each song, and had a great time in the company of friends and strangers alike. Lasting nearly two hours and 22-songs deep, the band ended with a solid five-song encore and left the stage to a wave of applause and massive cheers. It was a masterful performance, and given the intimacy of the venue, something I will probably never see again. Classic.